Anne Marie's trip to Guatemala followed a two week experience she had had as a fourth year medical student working with local health promoters. This trip took her to the Las Cruces and San Benito regions of El Paeten were one of the projects included an all day women's health clinic. 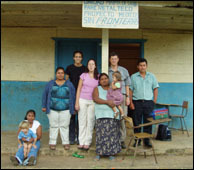 Basic medical and obstetrical care was provided at the main clinic in Las Cruces and in several makeshift clinics in more remote areas. The medical team also visited San Lucas Toleman, a coastal town where patients were seen in the local town hall. In addition to providing direct patient care, Anne Marie also participated in a program to train local health promoters, the main source of sustainable medical care in this medically under served country.